Intern of the Week: Zach Marmolejo! Get to know our latest (and tallest) intern of the week: Zach Marmolejo! Zach was voted Intern of the Week by his peers, who declared "He's always working hard and taking initiative to get things done!" And more importantly, "He's handsome and very polite to his mother!" You can catch Zach interning on Friday nights at DCH! He's the tall fellow who sometimes wears glasses, but sometimes doesn't! And he has tattoos, so you know he's a cool dude! Zach dabbles in both stand-up and improv, and he's a very funny guy. Check out the deets for his upcoming shows, as well as some neat facts about Zach, in this intimate Q&A we put together while sipping Appletinis on a rooftop patio in Miami! 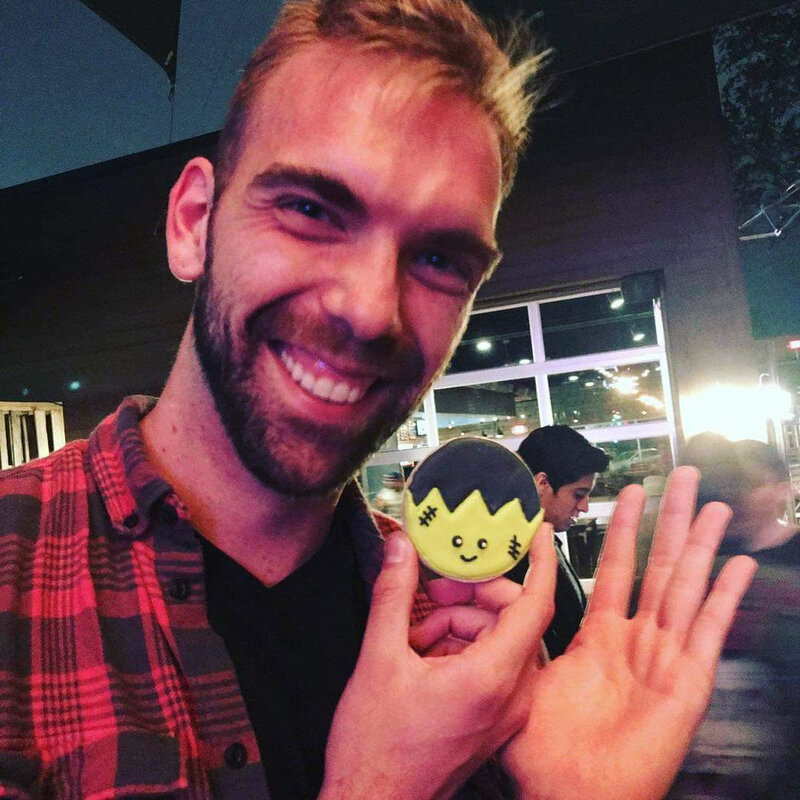 Here is a picture of Zach holding a miniature cookie version of himself! What is your most memorable experience working as a DCH intern? My most memorable experience working as a DCH intern has to be all the amazing people you meet. There’s all kinds of different people, from all different walks of life and it’s just so fun to hear their stories. If you won a bajillion gazillion dollars, what would you do with the money? If I won bajillion gazillion dollars I would hire an accountant to make sure that all my stuff is in order, buy my mom a house, give my amazing girlfriend anything and everything she’s ever wanted, and then retire to Mexico. What movie or TV character do you relate to most? The movie/TV character I most relate to would have to be either Homer Simpson or Al Bundy. I’m a big clumsy idiot that likes to pretend he hates everyone who might have a small drinking problem, but deep down I have a lot of love for everyone in my life. I’m a pretty vanilla guy when it comes to pizza toppings. Give me a good pepperoni pizza and I’m set. I don’t hate on other people for their choices though, so go crazy with the pineapple and avocado toast while vaping, kids. How do you plan to celebrate being crowned Intern of the Week? Intern shirt hung above the bar after it’s all said and done, and I’m only spoken about like an urban legend by everyone. Also I plan on going to Colorado so that should be fun. Any upcoming shows you want to plug? I have the extreme honor of being a part of the DCH Birthaversary Stand-Up Show on Friday, January 25th. This is the first time I get to do a show with my two biggest influences, Paulos Feerow and Hannah Vaughn, and it also features my best friend and absolutely brilliant comedian, Julia Sykora, as well as the amazing Shahyan Jahani and Scott Crisp, who I consider to be big influences as well. So please everyone come out to that and laugh at us. Older PostThe Next Decade at DCH!